You’ve made several attempts to increase conversions and somehow, you’re not getting the desired results. Maybe you think you’ve tried everything possible to drive conversions on your site. But have you tried reassessing your sales funnel stages? There may be some sales funnel stages that aren’t necessary, or some components that you’re missing out on. In this post, you’re going to learn about the four key components of a sales funnel to increase conversion rate. A sales funnel, with all its stages, is like a map that you design for potential customers to follow. It’s the path that you design for leads to take until they take a desired action. In other words, it’s the set of steps you lay out to acquire leads and convert them. A sales funnel can help you increase conversion rate because it allows you to cater to potential customers at every stage of the purchase process. If you don’t have proper sales funnel stages in place, there will be no structure to how you manage your leads. You may be able to drive some traffic to your site. But once visitors land on your site, they’re not sure what to do next. Your ad promoted an offer, but the landing page isn’t displaying that offer. This means visitors will have to either search for the offer, or leave your website. You need to have a plan to turn that traffic into sales, and increase conversions. And well-defined sales funnel stages help you do exactly that. With established sales funnel stages, you’ll have a set path that website visitors can follow once they land on your page. For example, maybe they wanted to find out more about your competitor analysis tool. And when they click on the link to land on your site, they immediately see a page that will educate them about the features and benefits of the tool, like in the SEMrush homepage below. After reading these benefits, they decide that they would like to try it out. So once they click on a button to go to the next step of the process, they see the pricing page. From there, they can select the best option that suits them, and then proceed with their purchase. This is just a basic example of a sales funnel, and how it can simplify the conversion process. Now that you understand the benefits of a well-structured sales funnel stages, it’s time to find out what you can do to create your own. Your sales funnel may have several components that you think are necessary to increase your conversion rate. The first stage of your sales funnel should focus on attracting potential customers. This is where you raise awareness about your business, and your product so you can eventually increase sales. It’s about generating the traffic that you need for driving conversions. There are many ways to carry out content marketing for lead generation. First of all, you need to create a blog through which you can share your expertise, and provide valuable content to readers. 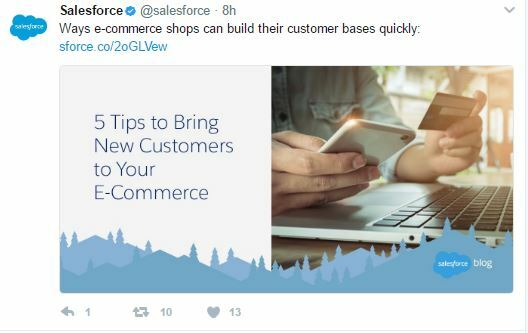 You can then promote your blog posts on social media, like Salesforce is doing. This is an excellent way to engage your social media audience, and drive them to your website. In addition to this, try guest blogging for reputable websites in your industry. In your posts, link to a relevant blog post or webpage on your site. 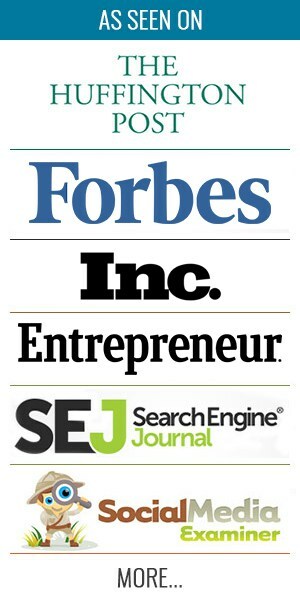 This will help you reach a relevant audience, and drive traffic to your site. You can also create interesting visuals, like infographics, and share them on relevant websites. Another way to generate traffic is through organic search. This means you need to up your SEO (search engine optimization) game and improve your site’s visibility. The goal is to make sure people can find you when conducting relevant searches. Optimize your website copy with high-ranking, low-competition keywords that are relevant to your business. And try building quality backlinks through guest blogging to improve your Domain Authority, which increases your search ranking. It’s not easy to reach a relevant audience organically. But you always have the option to draw in your target audience using paid promotions. You can launch PPC campaigns, and social media ad campaigns to reach a relevant audience. This can increase your traffic, and may eventually increase your conversion rate. 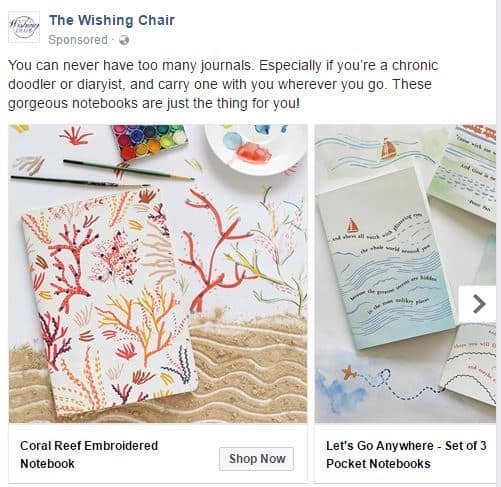 The Wishing Chair, for example, uses eye-catching Facebook ads to attract potential customers. Lead conversion is the part where you demonstrate your value to potential customers. You need to educate your visitors about all the ways they can benefit from your service or product. Hopefully, this will stir their interest, and they will become valuable leads. 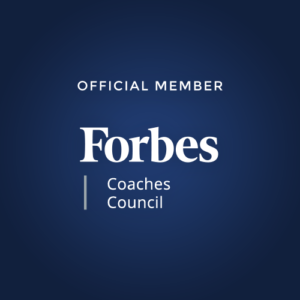 The ultimate goal is to convince them to take the desired action – whether it’s to download your free ebook, sign up for your free trial, or purchase your product. You need to set up a landing page that’s relevant to the referral traffic. 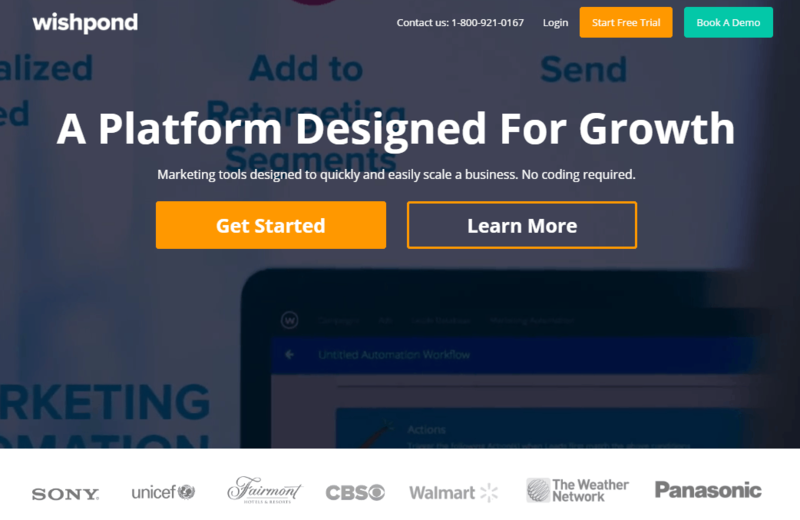 The purpose of this landing page is to educate visitors about your product, service, or offer. Ideally, it should have an eye-catching design, and highlight all of the benefits of your product. and an effective CTA (call-to-action). The Leadpages homepage is an excellent example of how landing pages should look. The headline immediately catches the eye, and claims that their tool is number one. The headline is followed by a short, yet compelling description of what Leadpages is all about, and what it can do. There’s a CTA button in a contrasting color, inviting people to start building their pages. To further engage visitors, there’s an attractive GIF demonstrating how the tool works. You have educated people about your product or service. But this may not always turn into an immediate conversion. You need to show your audience that your product or service actually lives up to your claims. This means you need to show social proof, such as testimonials or reviews from your existing clients and customers. By showing real customer or client stories, you can win the trust of potential customers and increase conversion rate. See how Kissmetrics shows the testimonials of clients that have successfully used their service. 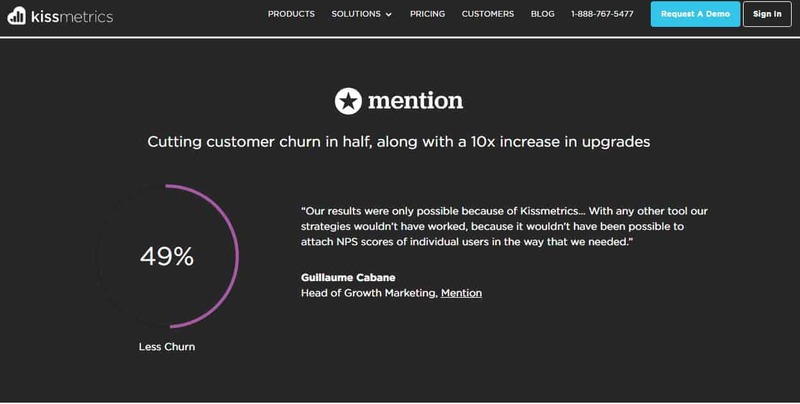 The screenshot below shows Mention’s Guillaume Cabane talking about the results they were able to achieve with the help of Kissmetrics. This can make for effective social proof, and establish authority at the same time, since it’s coming from an authority figure. In the case of consumer goods, you can display customer reviews on individual product pages. Or you can highlight some of the best reviews for your brand on your homepage. You can also showcase user-submitted photos that feature your products. iHerb displays customer reviews on their product pages and highlights the top negative and positive reviews to guide people’s purchase decisions. Another option is to display the logos of your past clients to show authority and social proof. Wishpond follows this technique on their homepage, showing logos of the brands and organizations that have implemented their service. This is one of the most important techniques to turn visitors into leads, and then potentially increase conversion rate. It involves offering something valuable to visitors in exchange for their email address or other personal information. This could be anything from a free trial of the service to a free ebook download. Ecommerce stores may even offer a discount to visitors who sign up for their marketing emails. 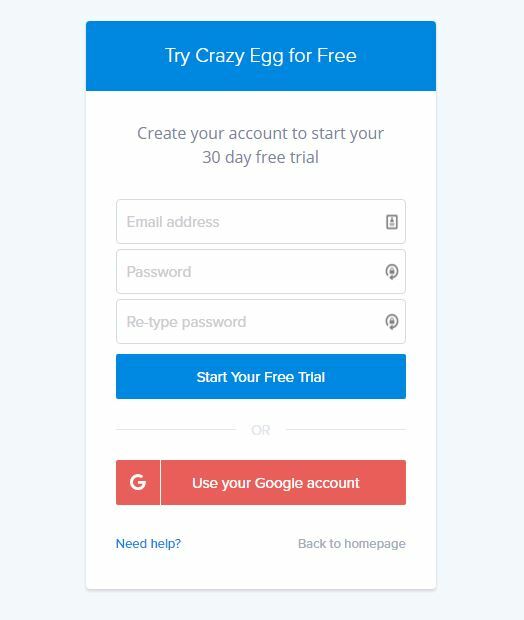 Crazy Egg offers a free 30-day trial of their heatmap tool in exchange for an email address. Visitors will also have to create a password so they can access the tool. Most of the time, the lead magnet will be part of your home or landing page. Or you can display it in the form of an overlay designed just for the offer. This way, visitors can focus on one thing at a time, and have a higher chance of converting. For example, here’s how the Content Marketing Institute implements the technique on their site. The lead magnet is an exclusive ebook. Visitors only have to enter their name and email address to gain access to the ebook for free. Lead nurturing involves building and maintaining a strong relationship with your prospective customers. And it’s an important part of the sales funnel if you plan to increase conversion rate. According to a Salesforce Pardot report, 83% of marketers believe that nurtured leads tend to be more successful than non-nurtured ones once the prospects enter a sales funnel. Set up a thank-you page, which will show up after visitors have successfully claimed your lead magnet. On this page, you can try cross-promoting products or services that you think the lead might be interested in. You can also get them to subscribe to your blog, or provide them with a discount for their purchase. The goal is to make a good final impression before visitors leave your site. 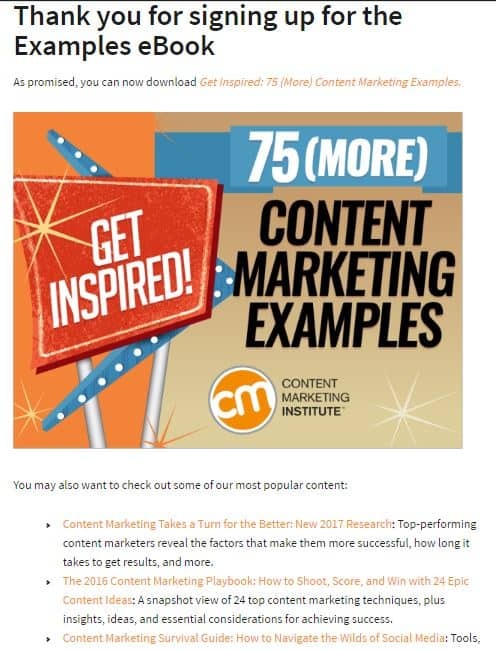 Check out how CMI cross-promotes their other content pieces on their thank-you page once you’ve signed up for the offer displayed previously. Since the lead has shown interest in the content initially promoted, there’s a good chance they’ll also be interested in other resources. So CMI provides them with easy access to the other useful resources they have available. If your lead magnet was a free trial of your service, you can send email nudges reminding them about the end of the free trial period. You could sweeten the deal by offering them a one-time discount they can use when signing up for the paid version. Or you could also send out email updates about your latest offers and blog posts. The idea behind this is to get them to come back to your site, and possibly convert. 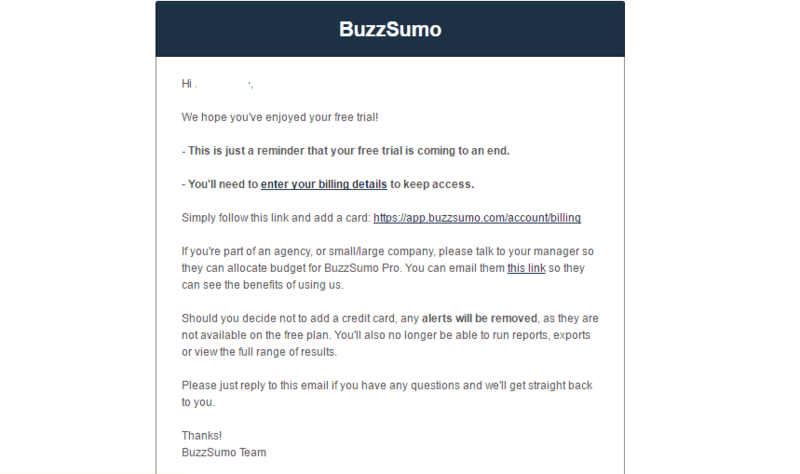 BuzzSumo, for example, sends out the following email reminder before the expiration of their free trial. It encourages leads to add their payment details to continue access to the tool. And they provide users with a link through which they can easily enter their card details. You can also use retargeting ads to re-engage visitors who left your site without converting. Maybe they’ve recently viewed a certain product, or even added it to their cart without buying it. You could display a social media ad for the product along with similar items in the category. Some ecommerce stores even send out email reminders about items left abandoned in shopping carts. Or maybe a visitor abandoned your site after viewing the pricing page. You could display ads that promote your service, and remind them about your business. Maybe you could even promote an offer for a discount because it’s likely that the visitor didn’t convert because of price issues. Whatever the case may be, the goal is to retarget your leads, and turn them into paying customers. Most businesses focus on lead acquisition, conversions, and sales. You do everything it takes to get a sale including cross-selling and up-selling activities. But, amidst all this rush to sell, you shouldn’t miss out the most important part of a business equation – your customers. According to Adobe, 40% of revenue for businesses comes from returning or repeat customers. If you too want to build a sales funnel that fills itself back up with repeat customers and valuable referrals, you need to focus on building and nurturing customer loyalty. So, the fourth important sales funnel stage is to keep your sales momentum going by earning more loyal customers. Your job isn’t done when a sales lead makes a purchase. In fact, a new part of the sales cycle starts there. You should follow up with all newly acquired customers to check in and ensure that they are happy with your product or service. Seek feedback from them. Some customers may dislike your product or service or find it did not live up to their expectations. You should listen to their frustrations as calmly as you would take appreciation. Try your best to resolve their problems as soon as possible. Offer a replacement or a refund if needed. It will make them feel valued and help you build trust for your brand. Follow-ups are also a great way to take the relationship forward and stay in touch. It takes much more effort and expenses to acquire new customers than to retain your existing ones. You can easily nurture your relationships with your customers by offering them a rewards program. Many brands offer a rewards program to customers who make frequent purchases. You can offer your customers free merchandise, rewards, discount coupons, or access to new products in advance. Reward programs don’t always need to be free. You can also charge an upfront fee and provide VIP benefits to your customers. A perfect example of this type of loyalty program is Amazon’s Prime Membership program. 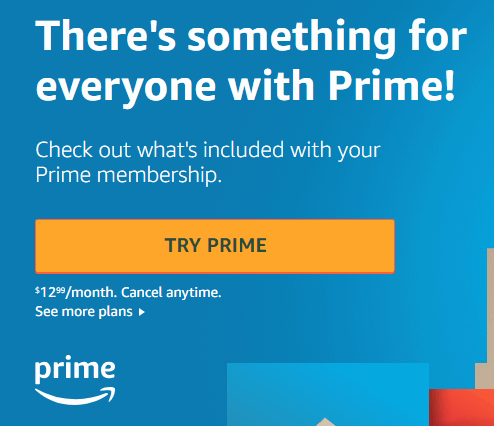 For $119 a year, Amazon Prime users get great value for their money. They enjoy free, two-day shipping on millions of products with no minimum purchase amount. Prime users get access to several entertaining original series like “The Tick” and “The Last Tycoon,” and thousands of popular movies and TV shows. They also get to read one of six editor’s picks for free each month. Loyal customers come back to make more purchases. At the same time, they also bring you more business with word-of-mouth advertising. Many of them are willing to refer your brand to friends and acquaintances if they truly loved their buying experience. You can further boost the number of referrals you get by offering a profitable referral program to your customers. 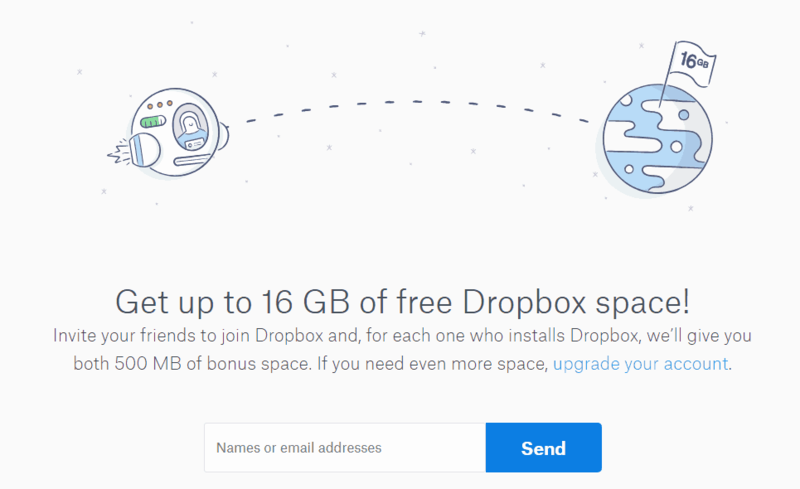 Dropbox has one of the best referral programs, which greatly contributes to its growth. Their customers get more free space for referring others. And the referral users also get some more space in their Dropbox account. It’s a win-win for both. These are the four most essential components of a sales funnel. But you can always add more components based on your needs and goals. For example, if you plan to not only acquire new customers, but also retain existing ones, you need to include a plan for post-sale nurturing. You can basically add different components as long as they serve a purpose, but make sure these four essentials are part of your sales funnel. If you have any questions, feel free to ask me in the comments below. You can even share your thoughts on the tips given here, or share additional tips that have worked well for you. And if you need my help to increase conversion rate, you can always reach out to me.